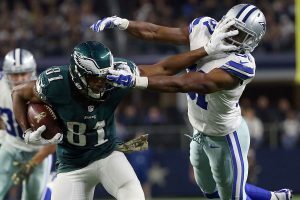 This week’s Sunday Night Football game will be a battle for the NFC East as the Philadelphia Eagles travel to the AT&T Stadium in Arlington Texas to face the current NFC leaders the Dallas Cowboys. This division rivalry game should be one of the best of week 8. After winning five consecutive games, the Cowboys finally had their bye week; this much-deserved rest has given them time to heal and this week we should see the return of some of their injured players including wide receiver Dez Bryant who missed the last 3 games due to a hairline fracture in his knee. The Cowboys offence, led by rookie quarterback Dak Prescott has been very good even without Bryant, and there is no question that having him back will make them even more dangerous to contend with. However, things won’t be all smooth sailings in this game for Dallas, the Eagles stopped the Vikings in their tracks, taking away their undefeated status last week, placing in them in an excellent position to overtake the Cowboys in the lead position in the NFC East. Much like Prescott, Carson Wentz is another rookie quarterback with a bright future, it will be very interesting to watch these two on the field this weekend. Wentz has not been as good as he was at the beginning of the season though, but, in his defense a lot has to do with the fact that Matthews is his only target down the field, this is something that the Eagles must address and quickly. Wentz did not look as confident last week as he did at the beginning of the season, against the Vikings he only managed to get 138 passing yards for one touchdown and two interceptions. Wentz will have a hard time against the Dallas Cowboys defense, which is only allowing 17.8 points per game, placing them as 7th best in the NFL. Which brings me to my first prop bet prediction for this football gambling game, Wentz will fail to reach the 200 passing yard mark in this game. Check out the line for this prop at AceSportsbook.com and put your money on the under. My other NFL prop prediction is on Ezekiel Elliott; this kid is on fire! As a rookie, he leads the league with 703 rushing yards and 5 touchdowns, making him the best running back in the NFL this season thus far. He has run for more than 100 yards in four straight games, in his last game he racked up 157 rushing yards, a season record for him. I predict he will break the 200-yard mark against the Eagles, who are not good at stopping the rushing game, allowing on average 102.7 yards per game. As for the game the Cowboys are 4.5 point favorites at home, Prescott gets another week to work his magic before the Dallas management decides on Tony Romo, which frankly should be an easy decision… ditch that douche bag! Prescott has done more for this team in his rookie year than Romo has done in last 10 years. I’ve been saying it for years; the Cowboys won’t amount to anything until they get rid of Romo. Anyway, now that I got that off my chest, Dallas should have no problem winning this game and covering the spread, they easily win this contest by a touchdown.